I’ll start with the readings. Many of them helped me understand why these visualization tools are useful for digital historians and humanists. John Theibault’s article was the most approachable on the subject and definitely a good place to start. I think the biggest takeaway from his article was the idea that visualization is meant to aid interpretation. It seems to me that most of these tools are most helpful in the research stage of a digital project and they are not necessarily something that would be displayed on a website. Or if they were displayed, these visualizations might be worked into an “about” page where you describe your research methods and practice. In terms of the activities we completed for this week, I’m struggling to determine if they would be useful for my project at all or for anything I might create in the future. These tools still seem so foreign to me that it’s difficult to wrap my mind around using them in a truly effective way. 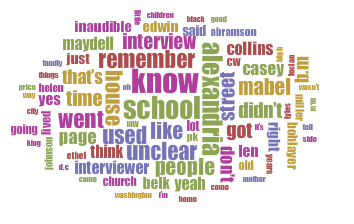 For the text mining, I decided to download and convert to plain text 12 oral histories from African-American Alexandria residents, most of whom lived during much of the early to mid-20th century. Once I created the visualizations using the Voyant tools, I realized I probably didn’t choose documents that made up enough text to make a quality visual. The oral histories were relatively short and probably did not make for enough text to mine. It was cool to see the word “school” come up as one of the most frequently used. It didn’t really surprise me as many of the interviews focused on the segregated schools in Alexandria. Along with the wordle, I created a network but it didn’t really give me anything that made sense. I have to admit that I could not for the life of me get Gephi to work. I was super proud of myself for figuring out the instructions to replace a portion of the code. But I still couldn’t get the program to open. I have no idea what I did wrong but I had to admit defeat on that one. I agree that it doesn’t seem surprising to see that “school” was mentioned a lot in the oral histories as it fits the time period, however looking at the words mentioned, I noticed that there appears to be people’s names commonly mentioned. Are those the interviewees or are those people important to the local civil rights movement? I also didn’t have any luck with Gephi and had to use Cytoscape instead. It will be interesting to see if anyone had any luck with Gephi. I love how you pulled so many different aspects of your topic. The origins of enlistment are fascinating! How did they enlist slaves straight from southern states? Great job getting Mallet to work, I never got past the download so it is neat to actually see what Mallet puts out. You might be getting a lot of partial words because your plain text file wasn’t interpreted fully. I had to create a massive stop word list to get rid of nonsense words and conjunctions.